These are ok. Nothing special as far as I'm concerened. I needed new travel-sized shampoo/conditioner anyways so these will work just fine. I've used this shaving cream before and liked it, so I was happy to get some more. I've never used Crest Whitestrips before and chickened out while trying to put these on. I have a bit of crowding in my bottom teeth and was afraid the strips wouldn't work evenly. Have you tried these though? What did you think? This was a new product for me. I'm not especially "in the know" when it comes to different mascaras. I tend to find one I like and use it forever. Although I don't know why this mascara needs to be so bulky, it sure made my naturally blond eyelashes look longer and darker. There were also some coupons for products I've never used, and wouldn't likely try even with the coupon. I would have rather had, even just small samples of those products. But I'm not complaining. 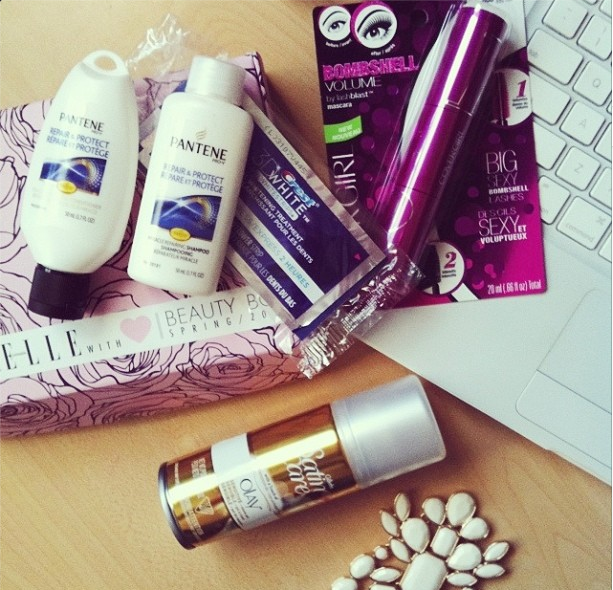 Getting a box with free beauty products is awesome. Here's the link again if you want to register with Elle Canada and maybe you'll get one of the fall boxes mailed to you!